Get the high end look you want to achieve without breaking the bank with the Westin stainless E-Series nerf bars. They're the best alternative available when it comes to higher priced tube steps. 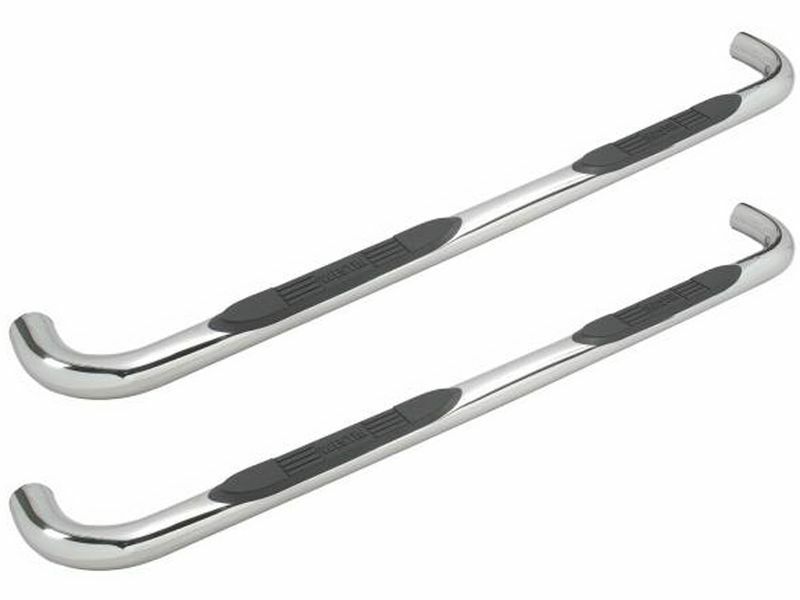 The three inch Westin stainless E-Series tube steps are custom fit to your vehicle, so you get a perfect fit when you order your pair. Because they're made from T-304 stainless steel, you're certain to get a heavy duty product that is corrosion resistant from the start! The E-Series' specially designed recessed step pads are made from heavy duty, tough plastic. This unique approach to tube step style makes it easier for you to get in and out of the cab of your truck, SUV, or CUV. Made to last, these pads are durable, provide great traction, and are UV resistant! Choose these to get a classic look with the polished stainless look. They offer unbeatable protection as well as Westin's famous guarantees. Get a limited lifetime warranty on the stainless steel finish. You can't beat protection like that! The installation on the stainless E-Series nerf bars is a breeze and most can accomplish it themselves. Bolt on design mounting kids are included (some drilling or additional mounting applications may be required on some models). Westin Automotive Products warrants these products to be free of original defects in materials or workmanship as long as the original purchaser owns the vehicle on which it is installed. This warranty does not cover damage resulting from accident, misuse, neglect, improper installation, fire, vandalism or any form of abuse. Westin will repair or replace, its sole discretion, any product covered by this warranty. This is a parts-only warranty and such repair or replacement shall be Westins only obligation, and the customers only remedy for a defective product. The cost of labor, installation, painting, incidental damages, shipping and handling will not be reimbursed. We do not warrant the paint or painting of our products. If, at our discretion, we choose to replace a defective part the customer (end consumer) may be responsible for any occurring freight cost, or a handling fee of up to $25.00. Westin Automotive Products, Inc. guarantees the original purchaser of Westin Towing Electrical products for manufacturing defects with regards to wiring, connectors, mounting brackets and tow accessories for 1 year from the date of original purchase. Westin shall have no liability for any incidental or consequential damages of any kind including property damage, or personal injury resulting from the use or misuse of this product. Easily install the stainless E-Series nerf steps in your own garage. Need help? Give us a call at 877-216-5446.